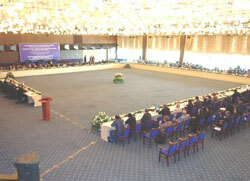 The Islamic Conference of the Ministers of Higher Education and Scientific Research (ICMHESR-4) held its 4th session, in Baku, under the high patronage of His Excellency Mr Ilham Aliyev, President of the Republic of Azerbaijan, from 6 through 8 October 2008 October 2008, on the theme of “Bringing Change through Scientific Youth Force”. The aim of the Conference was to provide an opportunity for the Ministers and Representatives of the OIC Member States to discuss various important issues pertaining to higher education and scientific research in the Islamic world and to evaluate and follow up the implementation of the Strategy for Development of Science and Technology in Islamic Countries, approved by the 8th Islamic Summit Conference (Tehran, December 1997) and adopted in its amended version by the 10th Islamic Summit Conference (Putrajaya, October 2003). Dr. Savas Alpay, Director General of the SESRIC and Mr. Mehmet Fatih Serenli, Acting Director of Training and Technical Cooperation Department at SESRIC represented the Centre at the Session. The opening session of the conference was presided over by H.E. Mr Elchin Efendiyev, Deputy Prime Minister of the government of Azerbaijan, with the presence of H.E. Mrs Fatma Abdullazadeh, representative of H.E. Mr Ilham Aliyev, the President of the Republic of Azerbaijan, H.E. Dr Abdulaziz Othman Altwaijri, the Director General of ISESCO, H.E. Dr Misir Mardanov, the Minister of Education in the Republic of Azerbaijan, H.E. Dr Dato Seri Mohamed Khaled Nourdin, the Minister of Higher Education in Malaysia and Vice-Chairman of the 3rd Session of the Islamic Conference of the Ministers of Higher Education and Scientific Research, H.E. Dr Ali Akbar Salehi, the OIC Assistant Secretary General, together with a number of Ministers of the Republic of Azerbaijan, the representatives of Islamic, Arab and international organizations, the Member States’ Ambassadors accredited to the Republic of Azerbaijan, and a host of prominent personalities. In his message to the Conference H.E. the President to the conference members, wherein he called upon the Member States to step up their efforts to foster the exchange of expertise among intellectuals and scholars, as well as the universities and the scientific research institutions in their countries, in order to achieve the objectives hoped-for in the conference, particularly the advancement of the scientific competences and professional performance of the individuals, and the development of technical capacities of institutions and the economic and social structures in the OIC Member States. H.E. the President also expressed his hope that the current session of the Islamic Conference will contribute to the development of new formulas for cooperation and practical initiatives in order to achieve the sought development and fulfill the common aspirations of Muslim peoples. H.E. Dr Abdulaziz Othman Altwaijri, the Director General of ISESCO, underscored the importance of the subjects and projects considered by the current conference, especially in a world heading towards the globalization of knowledge which starts from the globalization of curricula in universities. Dr Altwaijri pointed out that the current session shoulders particular responsibilities under the major challenges facing up the Islamic world in numerous interconnected areas. He underlined that the Conference takes on an added importance as it is expected to achieve a positive outcome that would enhance joint Islamic action in the area of higher education, science and technology. Afterwards, His Excellency Dr Dato Seri Mohamed Khaled Nourdin, Minister of Higher Education in Malaysia, Vice-Chairman of the 3rd Session of the Islamic Conference of the Ministers of Higher Education and Scientific Research, made an address in which he stated that the conference members at this current session are required to further emphasize the role of science and technology in the economic development, to orient the youth in the Member States towards scientific professions and activities and qualify them for the job market through high quality training programmes, and to show the government authorities and decision-makers the ways in which science can best meet the expectations and needs of society as well as the most efficient means to enhance the role of science in the achievement of development. H.E. Dr Ali Akbar Salehi, OIC Assistant Secretary General, delivered the address of the OIC Secretary-General. He pointed out that the world is passing through a critical time and its population as a whole is coping with various issues such as climate change, environmental degradation, shortage of energy, epidemics, conflicts and most lately melt down of financial institutions. He believed that these challenges could only be dealt with through a forward-looking strategic vision that would empower the Muslim world to tackle them by bolstering its collective will and joint action. He pointed out that the social and economic growth emanates mainly from science and technology and innovation and that the Muslim world has no choice but to rededicate itself to amass knowledge and to gear science and technology towards their development goals in order to gain an advanced position in the world. Dr. Savas Alpay, Director General of the Centre, made a presentation on “Education: Prospects and Challenges in the OIC Member Countries” wherein he started by expressing his gratitude and appreciation to the President, Government and People of the Republic of Azerbaijan. Similarly he expressed his satisfaction with the significant progress made by most of the member countries in increasing Net Enrolment Ratios in the primary and secondary education. He also underlined that since building a knowledge-based economy is one of the major challenges faced by most of the member countries in the 21st century, this would require developing a scientific culture that supports and encourages the contributions of the scientist and attaches importance to higher education, as well as the implementation of policies to ensure good quality education for all at the primary and secondary level. He concluded his address by pointing out the fact that higher investment in education should be associated with faster economic growth. Most OIC member countries have committed substantial resources to expand and improve their education systems, but these investments in education have not generated the maximal benefits for the individuals and the societies because of the lack of associated economic growth. The link between the improvements in the level and quality of education and economic growth should be strong. During plenary sessions, the members of the Conference presented each their reports on the efforts deployed by their governments in the fields falling within the ambit of the Conference for the advancement of higher education and scientific research in their countries, and harnessing of material and technical resources available as well as human and scientific capacities needed to achieve educational and scientific resurgence, in line with the national policies and vision of each member state. The Conference took note of the statements and reports made by the Member States and the international organizations, in relation to higher education and scientific research, and urged them to pursue their endeavours to promote higher education and scientific research, while taking into consideration the priority needs, the general policies and the available resources. The Conference adopted the Report of the Director General on ISESCO’s Efforts in the Field of Higher Education, Scientific Research and Technology. It also adopted the report of the Fourth Consultative Council for the Implementation of the Strategy for the Science, Technology and Innovation in Islamic Countries, and urged the Member States to renew their commitments to bring about scientific and technological development, to give it priority in their national development plans and to allocate at least 1% of their GDP to the promotion of science and technology. The Conference also adopted Transforming Economies into Knowledge based in the Islamic Countries, and the draft document on the Islamic Area of Higher Education. The Heads of Delegation decided to refer the draft document on the Ranking of the Universities of the Islamic World to the Member States’ ministers of higher education and scientific research to further examine it and give their opinions thereon. Having heard the presentation made by the OIC Assistant Secretary General and the representatives of partner bodies in the implementation of the project on "Atlas of Islamic World Innovation" the Conference commended the launching of the project. Furthermore, the Conference adopted the revised version of the Strategy for Science, Technology and Innovation in Islamic Countries and its Implementation Mechanisms. Moreover, the Conference also adopted the draft proposal for the creation of the Network of Women Scientists in OIC Member States.